Wouhou… why sleep when you can learn something new? Inspired at the end of a long day to try something new, while Mr T worked out how to use our new red home telephone, I photocopied a page from a very intense pattern by Elisabeth Kouji (from Patchwork Magazine, juin-juillet 2012, edited in France) and had a go. It looks like nothing on earth on this photo, but it seemed to work and make sense to me. I have put it on a bit of cotton batting to make a coaster, as one seam needed stabilising a bit as I cut the flower sail a bit short. But otherwise it was fun, fun, fun. 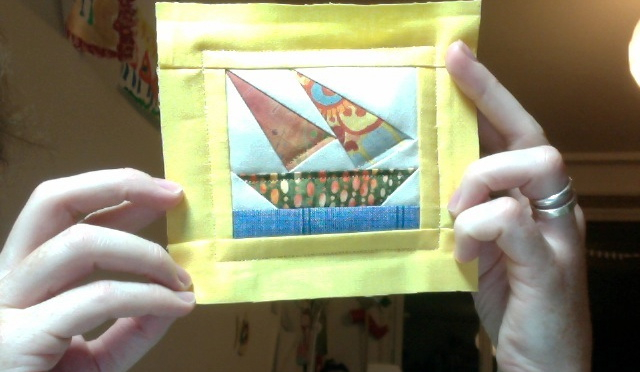 But I don’t think I’ll be making the complete pattern of this quilt that calls for 64 of these little chaps… in various patterns, with different sails. Very intense, methinks.